When you think of sports, probably the last thing you think about is art or the freedom of expression. You probably think about the high energy. The excitement. The competition. The sweat. The blood. The tears. All of these tend to be associated with sports, from the most physical ones like football, to the least physical ones like golf. But art and sports are not mutually exclusive. Far from it, in fact. Just look at skateboarding. Never have we seen a sport so closely linked to art as the skateboarding community. It’s a bit odd, because when you think of athletes, you might think of the stereotypical “dumb jock” and not of an “exceptional artist.” In that sense, you have to give your respect to the skateboarding community–without creativity or artistic freedom, skateboarding would probably be just seen as another crazy competitive sport. As it stands, it is also a powerfully creative force. There’s a belief that skateboarding was a spin off of surfing culture; the guys want to ride the waves when there weren’t any waves, so they ended up shortening the board and putting wheels on them to ‘surf’ the streets. Of course, eventually, it evolved into less of a spin off and more of it’s own thing–it’s own community, that started to become popular in the 70’s and 80’s. From then to now, people had a real connection with their craft–it wasn’t just another thing to be good at, it was an extension of themselves and what they liked to do. The ever growing popularity of the culture is great and as artists, it’s tough not to pay attention. Skaters have these great connections to their boards. They are aware that their board is part of them and they treat it as such. One of the most important things to a skater about their board is often the art on it. Most of the time skaters try to get a skateboard with art that relates to them or they customize them to continue to be a reflection of the individual. This culture is built around, and promotes, creative individuals. Whether it’s by adding stickers to their boards, designing it in Photoshop or painting on them with acrylics or spray paint, skateboard art is a force to be reckoned with. There are some amazing things seen on skateboards that one couldn’t even fathom for canvas. Skateboard art and skateboard culture go hand in hand. 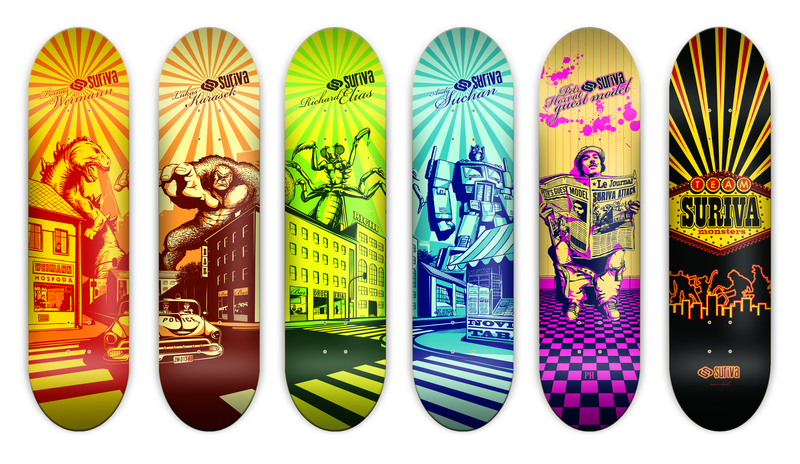 Here are some examples of some great skateboard art from individuals and companies. Skateboarding is really a sport like no other, one that promotes creativity and free thinking. It has sometimes blatantly, and other times silently, influenced many other cultures, especially in the realms of music, fashion and art. When one gets past the stereotype that the sport is for punks who are up to no good, it’s really easy to appreciate not just the physical and technical sport, but the art form. How do you feel like skateboard art and culture have influenced you? I think a cave painting design would look awesome on a skateboard. I did a four year stint at Santa Cruz Skateboards. I have about 2 dozen decks I designed, early- mid 90’s. This are really cool designs, and I agree with Ryan, that a some history, cave paintings or even some imp. events from world history would also look on a skateboard.